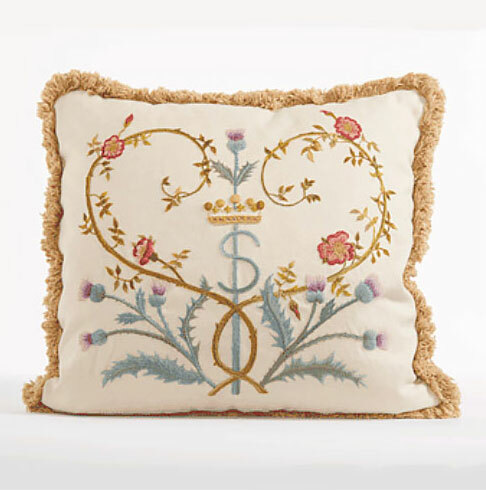 For your weekend entertainment, a little historical embroidery for you – from two different places. So let’s talk Opus Anglicanum and then a little crewel work! Over at the website for the Victoria & Albert Museum, you’ll find a nice little article on Opus Anglicanum, featuring a video demonstrating the techniques involved in this type of medieval embroidery. The article is titled The Making of Medieval Embroidery. It’s short and sweet, and the video is rather mesmerizing to watch! If you’re a lover of crewel work – and historical crewel work at that – you just might want to know about a gorgeous new kit available from the Crewel Work Company. The Glamis Rose, Crown, and Thistle crewel work kit is a new addition to the ever-growing line up of crewel embroidery kits offered at Crewel Work Company. Because it’s a new addition, it’s priced a little lower for its release – right now, it’s £199, through November 13. After that, it’s £250, so if it’s something on your Christmas list, now’s the time to get it! I set up my Mellerstain Firescreen kit that I showed you earlier this year. It’s one of my “winter kit projects” for the upcoming months. I figure it’ll take me through this winter…and next…and probably the next. I’ll be sharing progress on that as I go, along with some organizational tips, since it’s rather a doozy, with lots of thread! The Crewel Work Company is offering a 10% discount code to Needle ‘n Thread readers through the whole month of November. The code is NEEDLEN and there’s a place on the checkout page to add the code for an automatic discount. So if you have a crewel work kit on your Christmas list – or any of their fabrics or tools – get it in November! I’ve got several things in the works for you. For one, I’ll show you what I’m working on – too many things, actually! And I’m playing around with a relatively new-to-me thread. So far, I just love it! So we’ll have some thread talk coming up. I’m working with the company to get you a good deal on them, if you’re interested in trying them, too. Well, I’m off to do housework and laundry and a little bit of cooking so I can stitch guilt free the rest of the weekend. Here’s hoping you’re having a wondrous weekend, too, wherever you are! Great video–Thanks for the link Mary! I’m anxious to hear more about your thread adventures. I have quite a hodgepodge of threads myself, many of which have no labels so they’re mystery fibers. But my friends are so generous in sharing their odds and ends of skeins they won’t use any time soon. I’m fine with that. I get out my threads and it’s like taking a trip over the rainbow. The Opus Anglicanum video is really good and would make a lovely kit to embroider, the Glamis Rose is also lovely and its great they have a discount at the moment. I can’t wait to see your new pieces of embroidery and the new thread you are working with that will be interesting. I hope you get all your housecleaning done so you can concentrate on your embroidery. Thanks for sharing with us the Crewel Work Company discount kits and for the link to the video very interesting. ‘The Making of Medieval Embroidery’ video is very slightly annoying in that it cuts away just as the couching thread is about to pull the gold to the back of the fabric – which is the crucial bit of underside couching! Yes, I thought the same thing when I saw it! I wonder if the embroiderer might have run into a little snag at that point, and it was easier just to edit that out. :-/ The other annoying thing is the superabundance of ads on the video. It’s not like the V&A will make much from those ads – is it really worth it, on such a “pretty” video, to ruin it with the ads? But overall, I think it’s worth watching. Seeing the work up close, you realize that each stitch doesn’t have to be absolutely perfect to create a nice effect! Mary, will be anxious to see you get started on the Mellerstain Firescreen. I purchased the kit last year and it’s one project I am afraid to jump into! I pull it out every so often and stare at it and think,,,someday! It’s such a beautiful piece. Thanks for the link to the video clip, Mary. I find watching someone else sewing almost hypnotic! 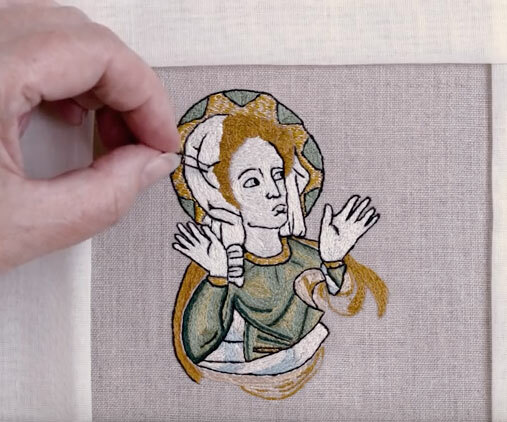 We had a programme on TV recently on the history of Embroidery with lots of references to Opus Anglicanum, and I’m awestruck at the quality of what they could achieve in the light available and without magnifiers, I presume! Previous Previous post: Home Sweet Home – A Give-Away!